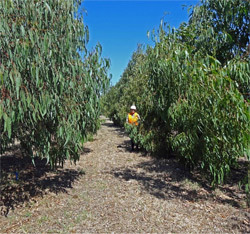 seedEnergy has been producing genetically improved Eucalyptus dunnii seed since 2004. seedEnergy's original seedling seed orchard was planted by Hancock Victorian Plantations in 1989 in Victoria as a broad based provenance-family trial . seedEnergy took over management of the trial in 2003 and has since developed it into a seedling seed orchard. In 2006, seedEnergy established clonal seed orchards at Cambridge, Tasmania and Mt. Gambier, South Australia using superior genotypes from the Victorian trial. seedEnergy E. Dunnii clonal orchard. Estimated means for seed-origin (NF = native forest, SO = Stockdale seed orchard, BULK = bulk seed production seed-lot). The Stockdale seed orchard was thinned in 2003. The original selection was based on predicted breeding values for growth and wood density from a genetic analysis using stem diameter and wood core data collected at age 14 years. These were combined in an index using economic weights derived for a breeding objective to minimise the total cost of kraft pulp production. In 2006, elite trees from 45 superior families at Stockdale were grafted and used to establish 2 clonal seed orchards at Cambridge and Mt. Gambier. These orchards have produced commercial quantities of seed since 2012. In 2007 and 2008 seedEnergy planted trials at Mt Gambier, South Australia and Lismore, New South Wales to test the progeny of its Victorian seed orchard. Additional progeny trials have been established in China and South America since 2010. Data collected from these trials has improved the accuracy of selection of seed orchard trees to maximise the genetic gain delivered to seedEnergy's clients. The trials were assessed for diameter, height, density, and pulp yield at age 4 years and 7 months. seedEnergy's clonal orchard seed is predicted to increase volume per hectare by 24% relative to native forest seed, based on the performance of the orchard seed in the Mount Gambier progeny trial (figure b). Additional gains in all traits are available to clients. "Seed and tree performance is influenced by nursery and silvicultural techniques, environmental conditions and the genetic composition of each tree. seedEnergy does not guarantee the actual performance of seed or trees due to other factors directly influencing the performance of each seed or tree. seedEnergy gives no warranty, expressed or implied, as to the productiveness, or description of any seeds and will not be responsible for the resultant crop."